If you don’t own them, I would like to gently suggest you go out and buy some bottle brushes RIGHT N O W. I got mine at Lee Valley and use them all the time. Really. I do! You are going to find that hard to believe after I explain this next little bit, but it’s nonetheless true. So … I sat down, all ready to give you a comprehensive list of what you will use your bottle brushes for and came up … pretty much empty. Mason jars. That’s a given. The reason I got them was to clean the bottom of my mason jars. You know. Where the dried up centipedes linger. And the tomato sauce, and the leftover soup. I know I use them for a million other things but … what are they? Couldn’t tell ya. I’m at a loss. I know I use them at least once a week. I just can’t remember what for. So, as it turns out I *can’t* give you a huge list of what you’ll use bottle brushes for. But not because bottle brushes aren’t handy in a hundred different ways. It’s because I’m brain dead for the moment. Better this moment than whilst taking an exam I suppose. Not that I take many exams lately. Or perhaps I do and just can’t remember taking them. This is turning into quite a nightmare this bottle brush post. Suffice it to say, in terms of the tools you have around the house I highly recommend bottle brushes. You’ll use them to clean a million different things. And once you do … if it isn’t too much trouble, could you shoot me an email letting me know exactly what they are? I also use older ones to scrub around my faucets, corners of my shower, and babies’ bath toys. They’re great for cleaning out vases! Those are actually test tube scrubbers! 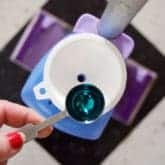 I used them so much when I worked in labs that I now hate them – true story! Cleaning between the faucet and the backsplash! & vases a lot! Dusting around light bulbs in those recessed cans or little glass drop light thingies. Getting (gag) hair out of the (gag) drain in the (gag) shower. Vases and car rims. Catching lint from deep deep inside the dryer tube. Hm. More to hit me as soon as I start to fall asleep. Cleaning sippy cups. And assorted kitchen gadgets and utensils, especially things with odd shapes. Wilton sells a tiny one with a regular brush on the other end that I use to clean my cake decorating stuff. I see at least half a dozen objects I use mine on..
you can do it… it is not a loss of mind, I have faith in you.. I have the same set, which I got at Marshall’s and I was over joyed to have such a variety of sizes. Since I love thrifting, I pick up some really filthy items. I just managed to clean some unknown gunk out of a cruet using one of these babies. This summer, I purchased some old bottles that were pretty gross and these helped a lot. I use an old toothbrush for scrubbing between the faucets and back splash. Baby toothbrushes work great too for those hard to reach places. The only problem is, that sometimes, when I have cleaned something old and mysterious, I do not want to use the brush on anything that holds food. So I have my “clean” food use brushes, to clean thermos bottles, etc. and my “dirty” set to clean the centipede encrusted items. My brain wasn’t working the other day, so I totally understand. I worked for years at an ice cream parlor and my boss used those to wash the soft serve machine. You probably have a soft serve machine in your basement but you forgot about it. and you sneak down in the middle of the night to brush it clean. Cleaning the stovetop, those places where the crumbs go-you can see ’em but can’t get to ’em without the brush. I use them to sweep under my frig and other appliances to keep the dog hair from clogging up the works! I use them to clean my stainless steel water bottles and coffee thermos. The openings are too small to get clean in the dishwasher. Bottle brushes are THE only way to clean them out before they mold. Blech! Karen/Todd – I was just wondering how I should clean my travel coffee mug. I was about to buy a new one and throw away the old, simply because I didn’t know how to clean them. Thanks!!! Oh Karen, please don’t do that. I don’t normally follow directions well, but when you put travel mugs in the dishwasher water slowly seeps into that airspace between the inner layer and the outer layer. If you pull off the bottom and look inside, you’ll probably find tonnes of mould. Ick! I’ve never done it again since I came to that realization. so basically i use em for bottles and anything else narrow and annoying to clean. The skinny brushes like those are also handy for scrubbing inside drains. You know, where all that slime and mildew collect. Not that I’m such a proficient housekeeper that I scrub the insides of my drains, mind you, but I imagine they would be useful for that. 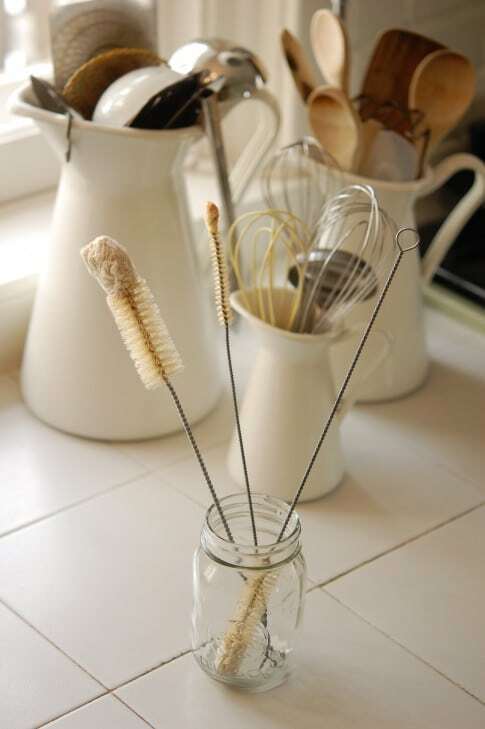 I have a baby bottle brush (it was the only one I could find; I don’t have a baby), and I use it to clean the insides of jars, naturally, but I also use it to clean tight spaces, like the ridges inside screw on lids. It also fits into my meat grinder perfectly, so now I can always get all the little meat pieces out from the back. I’ve used it to scrub out my pancake pourer. I’ve even used it to scrub vegetables clean! Yes! I was going to suggest the same thing. Their impossible to clean! I bought one specifically to clean the plastic straw that came with the container I use for my daily smoothie. Then I bought a glass straw and now I use the tiny brush to clean that too. Glass straw? Ya don’t say. You are BRAVE, young lady. Guinea pig water bottle-remind me to remind my son to clean it. Martha and Lucy are fussy. My husband’s huge Stanley thermos- at least I assume he knows he could use it for that purpose. That reminds me we need to clean our guinea’s water bottle too. And I have lost my bottle brush so I think a trip to LeeValley.com is in my future. 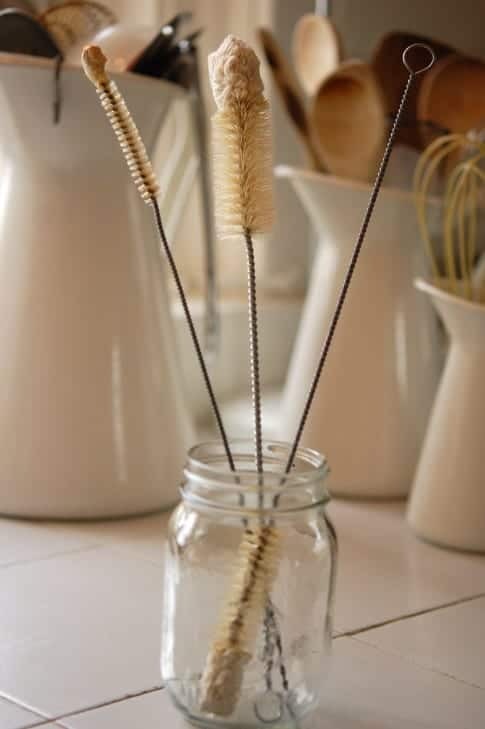 I remember my mom using a long skinny bottle brush like the one pictured in your blog to clean the tube of the percolator stand in the coffee pot. Well, I never heard of Lee Valley but used the link to their web site to see they not only have great bottle brushes, but a cool selection of gardening and woodworking books. Now, I’m in California, no where near a Lee Valley store but I do see they will be at the San Francisco Flower and Garden show in March so I will see them there. Thanks for the link to Lee Valley and for the percolator memories. Lee Valley ROCKS. They guarantee everything, are a delight to work with, and you can mail-order! had one in my hand yesterday, couldn’t think of what I would use it for so I didn’t buy it. drats. I know I use mine for cleaning out the Turkey baster but can’t think of anything else aside from what has already been mentioned. Fabulous tool that I would be lost without! This is most successful if your pot does not have the built-in strainer at the join of the pot and spout. Years ago I got a package of teeny tiny brushes for cleaning women’s electric razors (also Lee Valley)… they are fantastic for scrubbing small gnarly things….. Eat your heart out, Karen! I can always count on you, Karen. My mother had bottle brushes like this when I was growing up and I have been looking for some for years. The only ones I could find were big and plastic and yucky. They didn’t clean well either. Lee Valley will be my very next port of call, internet-wise. Thanks to you, I am also the proud owner of the rasp/grater from Lee Valley, and no longer does my lemon curd contain knuckle skin gratings. I’ve looked at those brushes dozens of times and haven’t bought them, because I’ve always wondered if they work that well. I.e., it seems like the tough-scrubbing bristles ought to be on the tip, right where they put the soft ones. Oddly, I ran across a post recently about making your OWN that I might try. You just cut off a piece of sponge to the size you want (Ooo–a SCRUBBY sponge! ), and proceed to twist it in a loop of coat hanger. It has potential. Very amusing post! They also clean mud out of the treads of my daughter’s indoor shoes when she forgets they are “indoor” shoes and wears them outside for recess. I own bottle brushes because we have a child – thus cleaning…wait for it…bottles. As he’s gotten older, they are invaluable for sippy cups. For adult sippy cups too – you know getting in between those little crevice areas of your coffee mug lid that has trapped all sorts of coffee mess? There are many other things I use ours for, but alas, I too am coming up blank. Wait, is this disease of yours contagious? Perhaps I should take a break from reading your blog and go back to work! I don’t have one and feel out of the loop. So I must get one for what I don’t know. 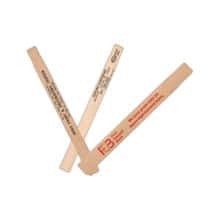 If I could find one for my heavy plastic straw that would be cool. If you use a Neti Pot or similar sinus irrigation system, the bottle brushes are good for cleaning those. Nobody wants to shoot mold up their sinuses. Well, I guess I should just speak for myself…I don’t want to shoot mold up my sinuses. besides the previously mentioned bottles, I use mine for vases, glasses/mugs (if I hand wash them for some odd reason) decorative objects d’art. I have a great seat of baby bottle bushes that the handles spins on it so they whirl around real fast and easy. my mom also has the same set and uses them on her fancy wine glasses because they are easy to use and grip. She loves them. Teapot spout (but no detergent please!). Most people aren’t freaks like I am and don’t have separate teapots for black and green teas, so the stains could interfere with the flavours of different types of tea. Or if you have a glass teapot where you could actually see the stains from the outside. Personally, for non-see-through teapots, if you are only making one type of tea I don’t think stains on the inside matter. Just rinse it with boiling water. absolutely the BEST thing for bottle/vase/jar-type items are magic balls (snigger) – http://www.lakeland.co.uk/F/keyword/magic+balls/product/8949. they are MAGIC. and as for buying special small brushes for cleaning in small spaces – well durrrrr, what do you think ready-to-chuck-out toothbrushes are for??? I am a poor college student who doesn’t have a lot of stuff, but these little guys are definitely going on my list. The past two days after reading this blog, I have been wondering why I don’t have any because I keep finding things that they would be so helpful for! Does anyone know where I can find some for cheap? Hi Tiffany! I don’t think you’ll find them cheaper than the $8 they are at Lee Valley http://www.leevalley.com/en/garden/page.aspx?p=10209&cat=2,50560,10209. You could try looking around your Dollar store, but I have a feeling the Dollar store ones won’t last! ~ karen! 6 bazillion posts and I need to add one more. I USED to use a bottle scrubber to get the edges of my carpet and stairs, and vacuum filter to add some life to it. But I found a “rubba scrubba” and I use that now. It is a rubber scrubber (bet you couldn’t guess) and it is also good for getting the hair up, and lots of other things but I suffer the same brain deadness you suffer. Just Google “rubba scrubba” and you’ll find the site. If ya want. No pressure. I was cracking up when I read this! I was looking for the perfect picture of a skinny bottle brush to send to my BFF who is domestically challenged and alas! Google brought me to you! I told her she could use this to clean the inside of her kitchen drain to clean the gook out of it so there ya’ go! One more use for the bottle brush. LOL! Yup. Just used my bottle brushes today to clean out … bottles. 🙂 Apparently denture cleaner thrown in them will help with bad stains, etc. ~ karen! The Art of Doing Stuff you say? And you can only come up with 1 use for bottle brushes, which you say we Must Have? Think you might want to update this one. Mmmm. No. Don’t think I will. ~ karen!